As of now I have only connected a DHT22 and a BMP180. I plan to have an air quality sensor in the bedroom and a UV sensor outside. In addition to the sensors I can also connect a Nokia 5110 display to the sensors. Since I have yet to find a good project box that will fit the display, I will use them without. 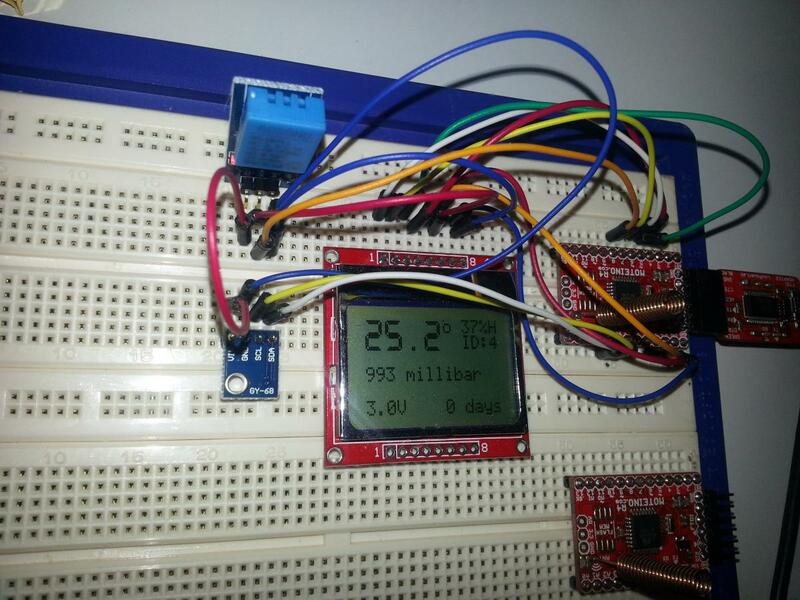 The image below shows the sensor with a display connected. I made the program/sketch so I only have to change a few #define to adopt it to any environment. Schematic an code at the bottom of the page. Please note that I have not yet made any code for the Light sensor, UV sensor nor the air quality sensor. I will build more when I need to. The sensors also have a 3mm LED that flashes rapidly every 32 seconds to show they are alive. Also, when the batteries are low, the LED will flash rapidly every 8 seconds. Nice indication to change batteries. If it turns out that these flashes will drain the batteries, I just have to change a #define in the code. According to my calculations the sensors will run for about 6 months on standby with a 3V CR2477 coin cell battery. Right now, size doesn't matter so I use two "huge" AA batteries. That should be enough for well over a year. The heatindex calculation I need to work on, as it's not correct. I have not decided if I want to do that in the Moteino sketch or in the Perl script used to upload the sensor data. Time will show. As of now I have 4 sensors operational. Bedroom, bathroom, livingroom and outside. I plan to make more, and maybe smaller, sensors in the near future. The sensors update every 6 minutes, that means a total of 40 database records per hour, 350.400 records per year.